Searching for fabric - and the deal of the week! I am designing a new quilt, that I will publishing soon, but I have a little problem. I am in desperate need of about a half yard of fabric! It is from the Jo Morton line called Ember Reds and Evergreen. This line is a few years old, so I'm having trouble finding it. 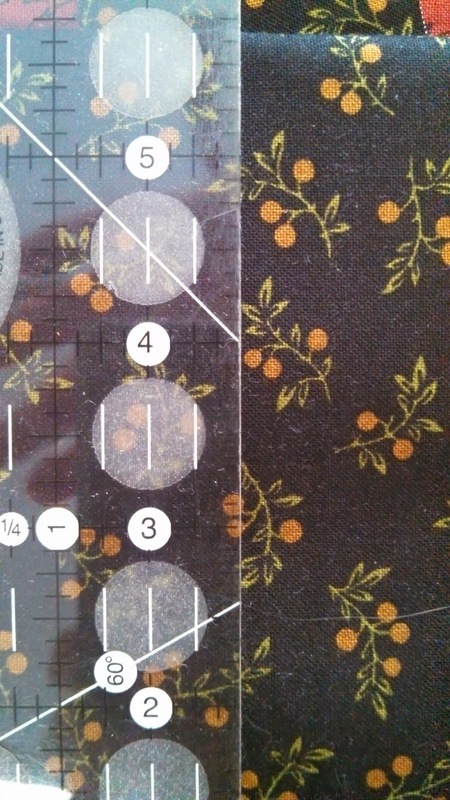 I did locate it on a website, and ordered 3 yards, but it turned out that they only had ONE yard - YIKES! Well, I made it work for the quilt top, but I really think I need to use this fabric for binding. So....can anyone help me out? It is a black background and you can see the small print with green leaves and gold berries. If you happen to have it, I would be thrilled to buy it from you! Did you know that the United States Postal Service has increased their rates again? BOO! It does not make me happy, but there sure isn’t anything that we can do about it. You all know that I love my mail lady and I also love my tiny local post office – and am very thankful to have them. I know a lot of people don’t have it as good as we do – they really take care of me and go the extra mile and I appreciate it. I would feel much better about this increase if it were going in the pockets of the people who look out for me! There was also an increase in postage last year about this same time. With that being said, I am going to have to raise my shipping rates. I did not increase my prices last year, but I can’t keep eating these costs. So…my deal to you is this…my postage will remain the same until next weekend. So, anything you order this week, you will still receive my old rates. Anything from Sunday on will be charged the new rates. Over the last several days, I have added several new pieces to the website, but thought I would share these as well. The following pictures are things that we finished over the weekend. You won’t find them on the website yet, but if you are interested in any of them, just send me an e-mail. Please do your best to ignore the awful glare on the red log cabin below! As always you can see more items on my website! "Hope Haven nurtures independence through a broad range of services for children, adults, and families with unique challenges. Committed staff value and equip individuals according to their strengths and abilities. Services are provided in Iowa and Southwest Minnesota." I really like the jacket parts on the left - I think this would make a good background for blocks. The red on the right is a really nice red, I was thrilled to find it (since red is my favorite color!). The peach-ish in the center is my least favorite - it was a skirt and was only a dollar or two, so I thought it was worth it. It will work for something. The other skirt is a black and white herringbone that is kind of cool. My dad gave me a couple of his old suits that he decided he would never wear again, and those are also in the pile that needs to be taken apart. Do you treasure hunt for wool? I can't wait to start putting some of this to good use! I have to share some kitty pictures (of course!). Here is Ozzie - minding his own business (but not so much minding his manners!). And along comes Miss Callie, who just can't stand it that he was chilling out! And now for the takedown...he always wins - you would think she would stop coming back for more! They are so entertaining - look at those ears! And because so many people are tired of winter and ready for spring - I thought I would share some pieces that remind me of spring - a little lighter and brighter than my usual fabrics. I put a bunch of new items on the website this morning, so be sure to take a look there. One of my customers, Teresa from Australia, made her matching 6" block and sent me a picture to prove it! 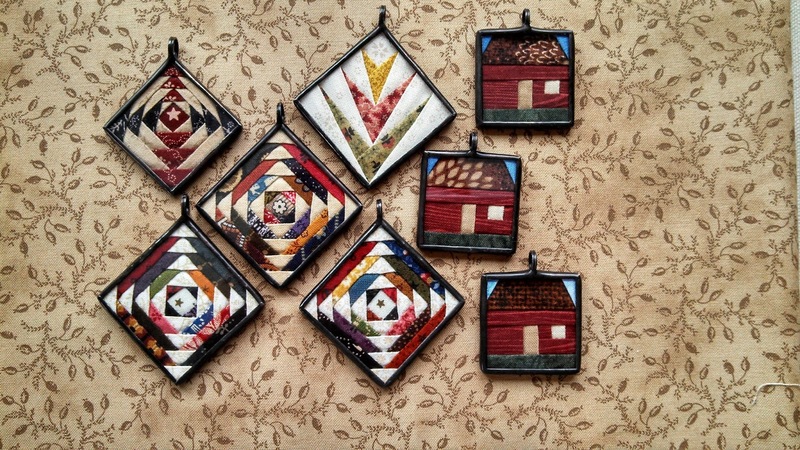 I love the fabrics that she chose - and you can see the size difference between her block and her little 3/4" charm. Cute! So glad that she shared this with me! Back to work! Hope you have a great day! I like to get up early in the morning - drives me crazy when people sleep the day away! There's things to do! 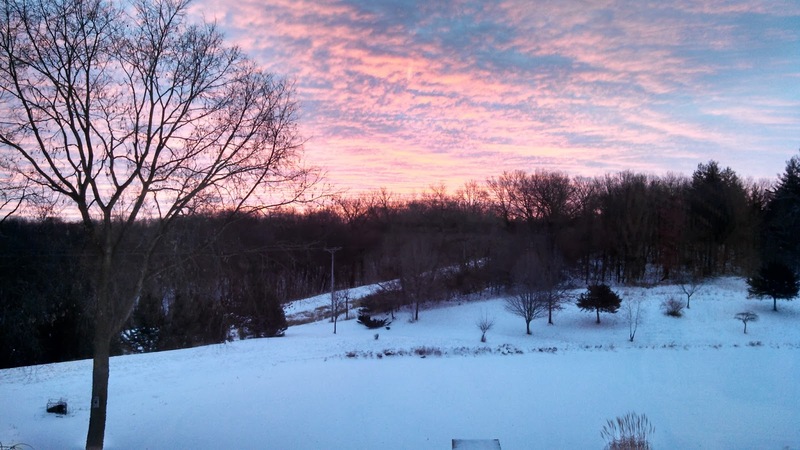 Here is one reason...this is what I see early in the morning, from my sewing room - isn't it just beautiful? Why would you want to sleep through that! Hope you have a beautiful sunrise or sunset in your day! Happy New Year! I hope everyone had a great Christmas and a fun New Years! Today I am hunkering down in my sewing room with my little fireplace cranking out the heat. We are supposed to reach a whole 5 degrees today - BRRRR!!! Unfortunately, I do have to leave my cozy house later this afternoon, but I'm trying not to think about that right now. A few days before Christmas we had sleet and then a little over 4 inches of snow. Not nice weather for people to have to travel in, but very beautiful to look at (from the same room mentioned above!). I couldn't resist taking pictures of the trees and the pond (through the window of course, so as always, you have to try to ignore the glare!). We had some warmer days when most of the snow melted, but Mother Nature gave us a day of snow yesterday, so everything is white again. It was hard to get a decent picture - I finally ended up closing the blinds. The one on the right is really pretty with the sun behind it - it's a really dark red. Now, I know snowflakes aren't red - but you know red is my favorite color - so I had to make one! I really love the turquoise-y one in the center, but it's not mine! We had lots of fun making all of these, and made many great memories at the same time. I forgot to mention in my last post that I was the winner of Janet O's giveaway! I was so excited to win! She made this cute little quilt - I love everything about it, and doesn't that stripe just make for the perfect binding? I also love her homemade soaps - they smell sooooo good. She also sent some of the Floral Gatherings fabric by Primitive Gatherings - but somehow I managed to not get that in the picture! Thanks again Janet - I just love it all! 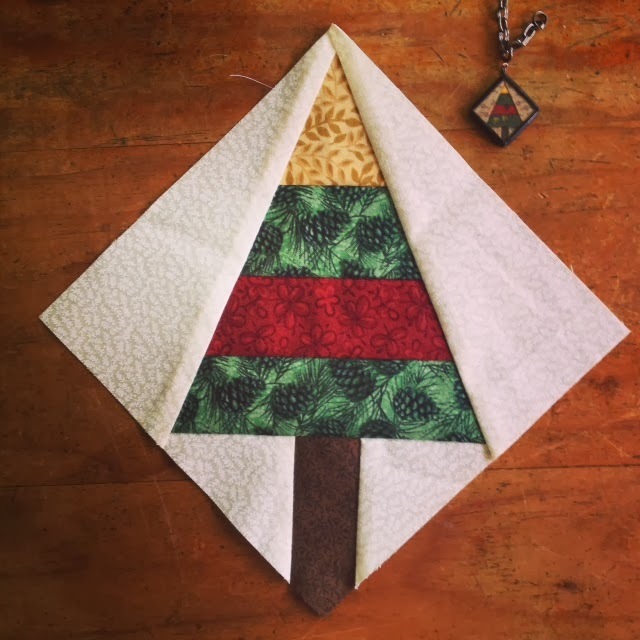 I did actually finish something before Christmas - this table mat called Old St. Nick, by Primitive Gatherings, has been in my stash closet since last Christmas. I was just determined to finish it before this Christmas, and boy, it was a close one! The last stitch was put in on December 23rd! Love that red wool! And also finished long before Christmas (why did I not post this stuff sooner??) is this baby quilt that I made for friends who have a new baby girl. She was born right after Thanksgiving and I actually had this little quilt FINISHED before her birth. But then, some things got in the way and I haven't been able to get the quilt to them or to see that new little baby. But, they have it now and I hope to see the baby in the near future! This pattern is called Ziggy Baby by Cluck Cluck Sew. I bought the pattern and all of the fabric at Inspirations, in Hills, IA. Just love her shop! The first 2 are 1" x 1 1/2" - this shape has been really popular - we were sold out of them for quite awhile, but now have a few online. The next 2 were made with some pretty, pink breast cancer ribbon fabric that was given to me by a friend. I made a few that she is going to donate to Relay for Life next year, and then a few to sell. I think I will also donate a couple more pieces when Relay happens this summer. And one last picture - you know I rarely have a post without a furry face in it! Callie and Ozzie got a present for Christmas that they both LOVE! 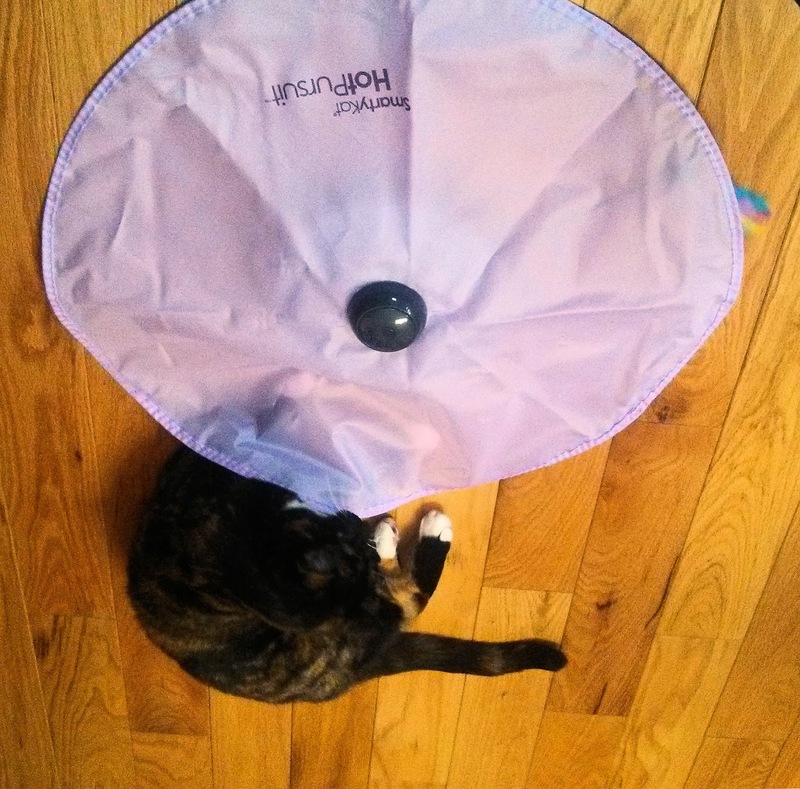 It has an arm with colorful feathers, that moves around under this circle of nylon fabric. It moves at all different intervals and directions, and has really captured their attention! They were not happy campers over Christmas, as they had to share their house with my 2 grandoggers! Wish they would learn to live in harmony, but it hasn't happened yet! Ok, it's time for me to go stand by the fireplace - I am FREEZING!